And next week, I start on Classic Who!!! I would like to make this blog about the complexity of the story lines in Who and how that changes with the changes of Doctors. For example, personally I feel that apart from the ‘Bad Wolf’ storyline, series one with Eccles-cake (Christopher Eccleston) as the Doctor, there isn’t that complicated a story running through it, although there are some truly brilliant episodes in that series ‘The Empty Child’ is actually one of my all time favourites! So in no way am I saying because they’re not complicated it’s any worse! 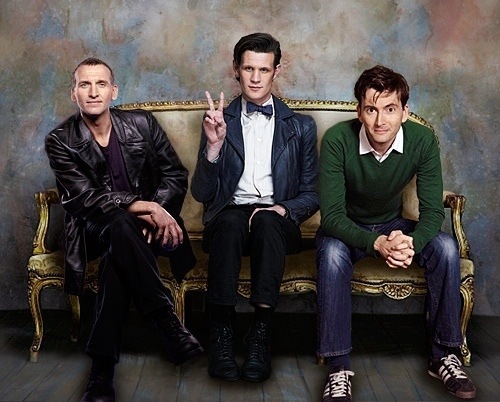 Okay so now, series 2, T Dawg (David Tennant) is the Doctor, mine and many peoples favourite Doctor! Here is where everything starts to get a bit more complicated, they carry on virtually all story lines and add a thousand new ones which all over lap and here is where you have to learn your history of the Doctor, here is where I would say Doctor Who changes from being a Series to a Flexi-Narrative drama. Then just when you thought it couldn’t become more difficult or brilliant, here comes the Walking Chin (Matt Smith). Now I didn’t think I would but I adore Matt Smith’s Doctor, I really do, and this series becomes one of the most Complex TV Dramas I have ever seen, they give him series 5 to keep it simple and then as soon as it hits series 6 it just explodes with complexity! And they carry that right through to series 7. So why is this? I actually think it’s mainly because of the fan base they have obtained, I don’t think they were expecting to get as many massive fans as they did in the first series, so they kept it simple so you could just pick it up and watch it if it was on, they when they discovered that they had gained a huge amount of fans who they (they being the various writers and producers) obviously trusted those fans to remain loyal, which they did, so it resulted in an increase of complex story lines that carry through many episodes even though 2 or more series. And then when they gained a monumental amount more fans, their own Fandom (Whovians) in fact, throughout T Dawgs time as the Doctor, when little Matty arrived to take over, the writers, mainly Steven Moffat now decided it was time to really lay it on because he knew that us Whovians would stick to it and keep watching and we love complicated! This entry was tagged Doctor Who, review, TV.